At various times over the life of this blog, I have brought you information on the highest version of Photoshop that would run on a 68K Mac (Photoshop 4), the highest version of Photoshop that would run on a PowerPC Mac (Photoshop CS4) and in today’s post, I complete this trilogy by bringing you information about the highest version of Photoshop that will run on the last version of Mac OS Classic – Mac OS 9.x. This might not seem particularly “blog-worthy”, but I thought it just might be, since for a very long time I have been laboring under the misapprehension that the highest version of Photoshop that I could run on Mac OS 9.x was Photoshop 6. Just in case any of the rest of you are also under this impression, I thought I would publish this little tidbit. The Photoshop 6 maximum is the case for Mac OS 9.0, but it turns out that this is not the case for later versions of Mac OS 9. The highest version of Photoshop that you can run on Mac OS 9.1 and above is Photoshop 7. I found out about this via the unlikely route of seeing a nearly “new in box” version of Photoshop 7 for Macintosh advertised on eBay. In the photo accompanying the listing, there was a sticker clearly visible on the box that stated compatibility with Mac OS 9. A little research on Adobe’s web site rounded out the details of this story: Mac OS 9.1 and above. At an unbelievably low initial asking price of only $30, of course I bid on it, and improbably, no one else countered. I won Photoshop 7 for Macintosh for $30 and free shipping. Back in 2006, Photoshop 7 would have set me back nearly $650. It is amazing how time changes things. 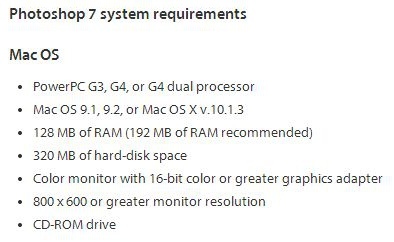 Despite the “PowerPC G3, G4, or G4 dual processor” requirement shown above, I was able to successfully install and run Photoshop 7 on my Power Macintosh 7300/200, under Mac OS 9.1. 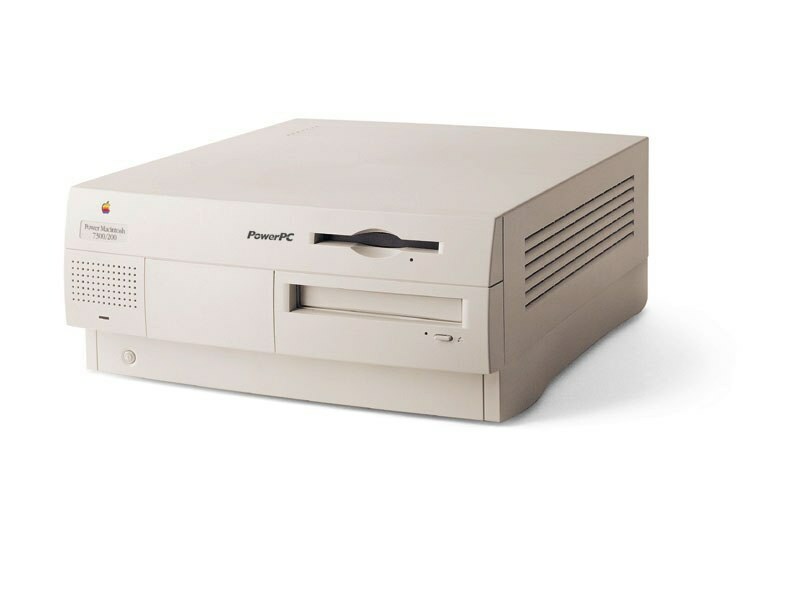 For those not intimately familiar with the specifications of the Power Macintosh 7300/200, it features a humble 200 MHz PowerPC 604e, one of the immediately predecessors of the PowerPC G3. How does it perform? Photoshop 7 takes 20s or so to launch on this machine, but after that, performance feels snappy and responsive. Given the launch time, it is clearly not the application you turn to for a quick image modification or for a simple format change from say GIF to JPEG for an image, but when you need more involved image manipulation, Photoshop 7 is a powerhouse, and well worth the launch time delay. So there you have it! For Mac OS 9.1 and above, the highest version of Photoshop you can run is Photoshop 7!